Recent widow MaryBeth Cashour moved six hundred miles to escape memories of her late mother’s betrayal and her husband’s mysterious death. While beachcombing for seashells to use at her artsy Christmas shop, MaryBeth finds a corpse rolling in the surf on Sandy Shores Island. The horror doesn’t end there. When detectives uncover a connection between the murdered man and MaryBeth, she’s their prime suspect. It’s not her fault the dead guy had one of her hand-painted Christmas sharks in his pocket—she doesn’t even know him. Besides, lots of people from the Mid-Atlantic region vacation in coastal Georgia. She insists it’s a coincidence he’s here. The cops don’t believe her. As her world comes unglued, MaryBeth strips the shellac from her memories, discovering secrets that endanger her life. But time to prove her innocence is running out faster than a rip tide. The killer is crafting up a new murder – MaryBeth’s. 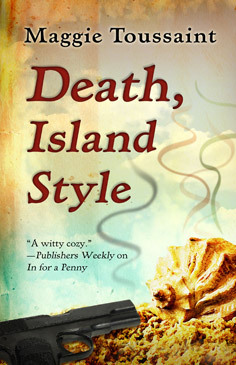 Death, Island Style is a cozy mystery flavored with eccentric southerners, Christmas music, and hand-painted holiday decorations. Set in sunny coastal Georgia, the book reveals the struggles of a young woman trying to make her Christmas gift shop profitable while dodging a murder rap. 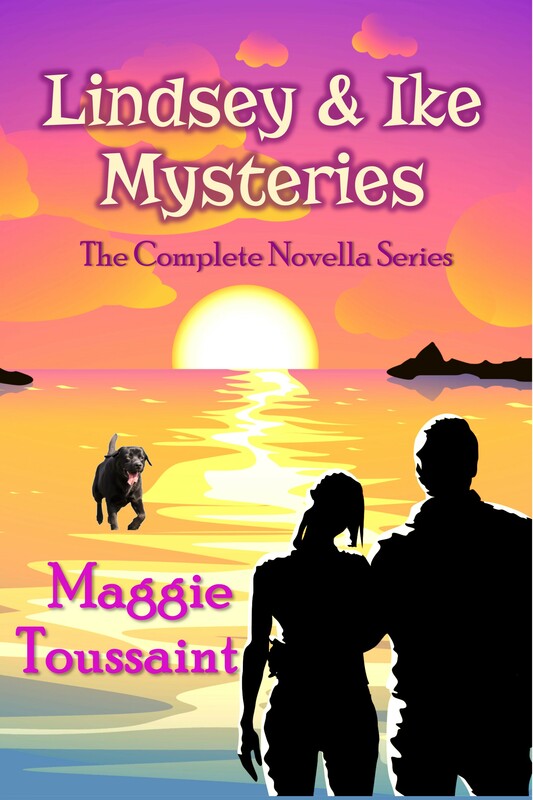 Beach scenes, a hunky pharmacist, and disastrous craft projects add sparkle and humor. One of the perks of my new life is walking on the beach. I love to sink into the crisp morning sand, leaving behind perfect impressions of each plump toe, slender arch, and narrow heel. Those footprints proclaim to the world that MaryBeth Cashour lives here on Sandy Shores Island. At least until the wind changes, the tide comes in, or someone else tramples my tracks. Oh, who was I kidding? My footprints were transitory, just like me. That’s the worst part about starting over, figuring out who I am and what I’m doing. I turn to face the wind, taste the salty spray on my face, and bask in the unfamiliar warmth of the October sun against my skin. Back in Maryland, a warm fall day like this was called Indian summer, but here in coastal Georgia, short-sleeved weather is standard fare. In time, I’d relinquish that northern concern that a howling snowstorm could hit at any minute, but for now, I was still stuck in that cold weather mindset of a nasty storm on my horizon. After my husband of ten years drowned unexpectedly in April, I sold everything but one framed picture of the two of us and moved back home, only to discover that my mom had kept her terminal cancer a secret. I spent the next three months watching her die. Two deaths in three months gave me the willies. Worse, it made me responsible for all their possessions. Grandmother Esther’s gilt-edged porcelain lamp was a family heirloom, but I hated it. And Uncle Wallace’s faded latch-hooked rug? It had clearly seen better days. The marble-topped buffets I listed on e-Bay, and I gave away Mom’s junky old car, which was in worse shape than mine. The horrid checkered tile bathroom floor I left as was, and the house sold anyway, thank goodness. By the time I’d finally gotten to the point of sorting through Mom’s personal papers in August, I believed I could see daylight. I couldn’t wait to finish this chore and do something, anything, else, but I learned a hard lesson. Be careful what you wish for. The information I discovered in her bank lock box knocked the wind out of me. You would think that being thirty-five years old, I might have heard about this by that time, but my mom never mentioned it. Not once. I can’t blame my dad for his silence, as he passed away two decades ago, but Mom had years upon years to tell me the truth. She sewed my prom dress, mailed me crafty care packages all through college, and single-handedly created beautiful decorations for my wedding. No mention of my adoption. Not even a hint. And it wasn’t like her death was unexpected. She knew the end was coming as surely as one ocean wave follows the next. Secrets. I hate them. And yet the shores of my life were littered with them, much like the scattered shells dotting this deserted beach. I stopped at another deposit of seashells and chucked them one at a time into my plastic pail. Justine Mossholder, the vibrant woman who’d sold me her gift shop named Christmas by the Sea, told me that part of owning the craft store was continually harvesting shells to make into Christmas ornaments. “Tourists love buying these local crafts as souvenirs,” she’d said. Her instructions might as well have been in Greek. Turns out I had no eye for color, glue guns hated me, and I couldn’t tell tulle from organza. So here I was, collecting shells as instructed, only I didn’t want the nice big paintable shells. I wanted the little itty bitty shells. I picked up one shell, then another, but that pace wasn’t satisfying. I wanted great glopping handfuls of them. Something about these little shells felt urgently right. I couldn’t explain my sudden unfathomable craving for them, but I needed these tiny shells as much as I needed air. With increasing fervor, my fingers grabbed clumps of miniature colored shells and tossed them in my pail. It was as though I was in a timed contest, and I only got to keep as many shells as I could cram into my hot-pink pail in the next ten minutes. Stupid, I know, but so was trying to start fresh when I’d lost myself along the way. I’d gone from functioning as a devoted wife and competent receptionist to a berserk seashell-grabber. What was I going to do? All I had was a yellowed piece of paper that said I was adopted. How the hell was I supposed to deal with that? My whole life was a lie. My throat tightened. I sat down and allowed the shells and dry sand to drizzle through my curled fingers. How could I figure out who I was? My past was a jumble of secrets, my lonely future too dismal to contemplate. I touched my gold heart-shaped locket, a treasured gift from Bernie on our first anniversary. Engraved inside were the words, “All my love forever.” Hollow words for a hollow life. I’m supposed to grieve and go on with my life, but the little kid in me wanted to stand up and shout, What happened to my Happily Ever After? That sappy fairy tale sentiment wasn’t real. It was fiction, and I’d best realize that MaryBeth Cashour was a ghost of a person. The offshore wind whipped my hair under my glasses. I flicked the tangled locks away from my eyes and stared out at the sea buoys on the watery horizon. Sea gulls lazily rode on currents of air above the cresting surf. I huffed out my disgust at their freewheeling lifestyle. Oh, to be so unencumbered. To let go and glide on the wind. If only I could be so free, so uninhibited. After all the changes of late, I couldn’t fathom living like that. I needed to know what was coming next. I needed structure and anchors to keep me grounded. The tides were regular. I’d learned that in a few short weeks. Natives of McLinn County, Georgia, set their watches by tidal fluxes. High water meant big waves, depth in the winding creeks, and delightful onshore breezes. Low water meant lots of beach sand, fish and crabs that could be caught moving with the tide, and offshore breezes. And nasty, biting flies. I smacked one that was stupid enough to land on my ankle. Take that you bloodsucking varmint. I buried the insect carcass in the dry sand. My gaze drifted back to the hopeful blue sky above the cresting waves and noticed those sea gulls were still wheeling over the same part of the sea as before, just off the beach. That was unusual. I caught sight of a dark shadow in the water. Something was out there beyond the breakers. Something big. Like a dolphin or a shark. Only it wasn’t swimming. It was drifting with the current. Curiosity had me rising to my feet. I brushed the sand and crushed shells from my Bermuda shorts and cupped my hands around my glasses. The dark shape appeared to be quite long, maybe six feet long was my guess. And it was definitely cylindrical, like a log. The object approached the shore. It bobbed in the surf, slowly rolling over, a dark back, a light underbelly. That’s when it hit me. My upside-down life wasn’t completely ruined. Things could be a lot worse. I could be the dead guy floating in the ocean.